There’s something about a small, urban storefront converted into a theater that I love. Maybe it’s just my Chicago origins where storefront theater spaces abound and where I first experienced professional theatre as a professional wannabe. That city has a slew of them, so many in fact that they’ve at times become their own marketing tool and arts category. As a young man studying acting I remember numerous trips to Steppenwolf in their old little storefront space at 2851 N. Halsted. Sadly today that spot is some modern building housing something called Golf Tec, an indoor golf lesson business or some such thing. To some people those are hallowed grounds for the pioneering work done by that company in the 1980s, and I cringe at the thought of a modern building filled with plaid pants and cleats taking up that space. Also I’m not much of a golf fan, but still – I’m sure you see my point. I remember walking in to that theater for the first time and was surprised at how….small it was. There was hardly any lobby to speak of, the box office was a tiny corner, the ceiling was low and the place felt cramped. On another visit I recall walking in and not noticing any of those those elements because it now felt comfortable to me, but I immediately noticed the Tony Award proudly and simply displayed in a small glass case in one corner. The theater space itself was a shallow stage, with a low ceiling. There was no room to fly anything in and if there were ever any wings it was only due to scenic design and perhaps by hanging black curtains. It wasn’t the fanciest place or the largest, but that’s not what that company is or ever has been about—it was about the work, the plays, the acting, the art of theatre. And I saw many a magic and beautiful moment on that stage, up close and personal. After Steppenwolf built their current home, others moved in and the storefront continued to be a theater, but in 2004 it was demolished. 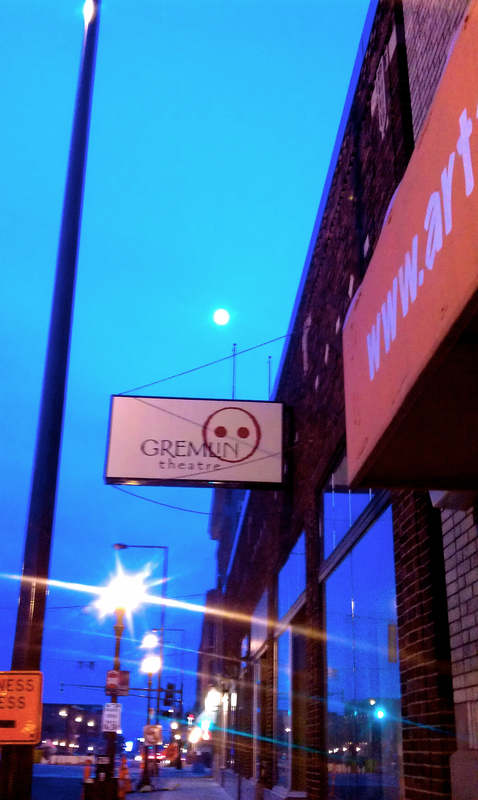 I’m thinking about all that now because last night after my show I was having drinks with some friends and learned about this article: Gremlin Theatre looking for a new home. That is the theater where I’m currently doing a play. It’s a small, intimate, store-front space in an old building on University Avenue in St. Paul. The company moved in there only about five years ago, and has put a lot of sweat equity into it, as it wasn’t a performance venue prior to them. In addition to their own productions, they lease the space out to other, nomadic, groups. It has a small lobby, the box office is an old bar in one corner, there’s no fly space, no wings, the ceiling is low, the stage itself is shallow and there are about seven rows of tiered seating. Storefront spaces like this aren’t as common in the Twin Cities as they are in Chicago but few have reminded me as much of 2851 N. Halsted as 2400 University. Gremlin, and the other theatres that have used its space, are gritty groups. Gremlin’s own mission includes “Gremlin Theatre seeks to… [perpetuate] the idea of theatre as a relevant, entertaining, and socially valuable activity for the audience and the artist.” An intimate space like this is just what that mission needs. There’s something about how a storefront space is accessible and pedestrian friendly, and how a theater in such a place makes it feel like an integral part of our community, that it enhances the experience as both an audience member and as an actor. There’s no stage door for separate entrances by company members, it’s not in a big building with other businesses with which to compete or have to accommodate, and yet there’s a nice big window in front that thousands of cars drive by and pedestrians walk past and they can see that the arts are present and active and essential to our local culture. It’s intimate and immediate and there’s nothing like it to put an audience and actors in the same space. And in my heart and mind, we as theatre artists and we as a community need more of this, not less. 2400 University closes as a such a space this coming August, and the owners will renovate it into something else entirely. I sincerely hope Gremlin finds a new home just as special.